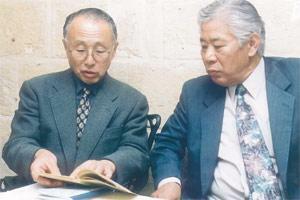 Mr Sasaki (left) discussing a photo album with Mr Michio Endo. Sixty-eight-year-old retired journalist Yutaka Sasaki of Yokohama had wanted to come to Malta ever since he listened to his father's first world war experiences of the island. Mr Sasaki's father was one of the lucky Japanese who had managed to make it back home after spending 16 months in Malta. Seventy-two of his friends had been lost here and were buried at the Kalkara cemetery. Mr Sasaki's wish has finally come true. He is in Malta until Monday as part of a nine-day press trip organised by the Malta Tourism Authority's Tokyo office. And the island has not disappointed him. In fact, he would like to visit again soon for a longer period. He said in an interview that he was the second son of Chikashi Sasaki, who had come to Malta in April 1917. At that time, Chikashi Sasaki was the lieutenant and chief engineer of the newly built destroyer Matsu of the Japanese Royal Navy. He was 26. He retired from the army in 1936 with the rank of captain engineer. He died in 1969. In a book Chikashi Sasaki wrote in 1955 (in Japanese) and which was published in Japan, entitled "Experience the Grace of God", he describes how on June 11, 1917, the Destroyer Sakaki had been hit by a torpedo from a German U-boat near Malta and 59 officers and sailors had died. On the following day, he had been ordered to collect dead bodies and fuel to burn the dead. Their remains had been buried at Kalkara where the Monument of the Japanese Royal Navy was later built. Yutaka Sasaki, who has been to the cemetery to pay his respects to the lost Japanese soldiers, laid a wreath at the foot of the monument. He has many albums full of photographs taken by his father during his experience in Malta. Mr Sasaki said that in his book, his father also wrote about attending services at St Andrew's Scots Presbyterian Church in Valletta, which he has also visited. The Japanese Navy, Mr Sasaki said, had come to the Mediterranean to protect British naval vessels from German U-boats. Once, they saved 2,500 men (crew and soldiers) who had been on the British ship Transylvania. The ship had sunk but the men were saved and the Japanese soldiers had been thanked by Britain for their deed. His father, Mr Sasaki said, had also been given the George Cross medal by the British Parliament shortly after leaving Malta. MTA Japan representative Michio Endo said that as soon as he started to promote Malta in Japan, he had asked tour operators to include the Kalkara cemetery in their tours. "The Japanese feel a certain connection with this cemetery even though the people buried there might not be relatives. "The Samurai spirit within us still exists," he said. Mr Endo said he would also like to develop a niche market for retired Japanese to come to Malta for three to six months. His one concern is the lack of people who speak fluent Japanese in the first aid sector, as these people, who would be of a certain age, would need to be able to communicate without difficulty.